Definition at line 1600 of file lltooldraganddrop.cpp. Definition at line 1604 of file lltooldraganddrop.cpp. Definition at line 1603 of file lltooldraganddrop.cpp. 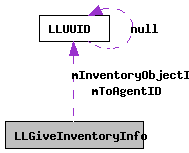 Referenced by LLToolDragAndDrop::handleCopyProtectedCategory(), and LLToolDragAndDrop::handleCopyProtectedItem(). Definition at line 1602 of file lltooldraganddrop.cpp.